Perth Walkabout will be featuring favourite arts and cultural places to visit in the coming weeks. Set in the heart of Northbridge, the Art Gallery located within the Perth Cultural Centre precinct always makes for an interesting outing. It is a visual feast of exhibits which will keep you enthralled for hours. 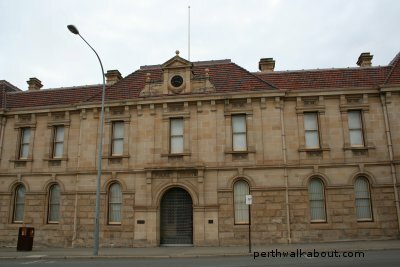 But be warned that the Centenary Galleries part of the Art Gallery were previously the Perth Police Courts in another life, so make sure you don't end up in jail! Note that the Centenary Galleries have to be accessed via the main building of the Art Gallery of Western Australia. Find out how to get to the Art Gallery. The Western Australian Museum is set in the heart of the Perth Cultural Precinct and is well worth a visit. It has an amazing range of collections to view covering archaeology, ecology and anthropology amongst many other interesting themes. Find out how to get to the Western Australian Museum. If you are planning a trip to the port city of Fremantle, make sure you visit the Western Australian Maritime Museum at Victoria Quay. It is hard to miss this distinctive building built in late 2002 whose boat like structure appears to have stranded itself on land. Read more about the Western Australian Maritime Museum. Go to Things to Do main page.